On its 50th year, Concepcion-Carrier, the country's leading provider of cooling solutions, return to its faithful customer the love that they shared to the company for 50 years through the launch of their campaign Me and My Carrier. Divided into two parts, this campaign aims to find the oldest working Carrier air conditioner in the country through Me and My Carrier and to know how Carrier air conditioners changes the lives of our people though Carrier Experience. For the Me and My Carrier contest, top five oldest working Carrier air-cons will get to win brand new top of the line 1.0 HP Carrier Designer Series air-con. Known for its stylish silver and black color grilles, this Designer Series has also an intelligent cooling functions that acts like a prepaid card and allows you to program the hours of your air-con usage based on your monthly budget. I know you'll ask how are you going to present your oldest air-con, here. You just have to send your details by filling up the entry submission form that can be found at the Carrier Philippines website. Right after you fill up the form with your name, home or business address, email address, contact number, Carrier's units model number or serial number, the month and year you bought the unit, the location of the unit in your house and a colored picture of it, you will receive a printable notice from the website acknowledging your entry. If you wanna do it the old way - via snail mail - you can do so too, just fill up the form together with the picture of your working old Carrirer air-con and send it to "Me & My Carrier Contest" c/o Corplan, Inc., T-1B Sunvar Plaza, Amorsolo Street corner Arnaiz Avenue, Makati City 1200. After selecting the top 5 oldest air-cons based from the received entries, an email and phone notification will be sent for the qualifying entries to be expected. YES! There'll be a physical inspection to make sure that the entry that was sent to Concepcion-Carrier is valid and the air-con is still working. Once the unit passed the physical inspection, it will be declared one of the top winners for Me & My Carrier! The brand new Carrier Designer Series 1HP window room air conditioner prize will be delivered to the winning household and a basic installation of the new unit will be done for free! 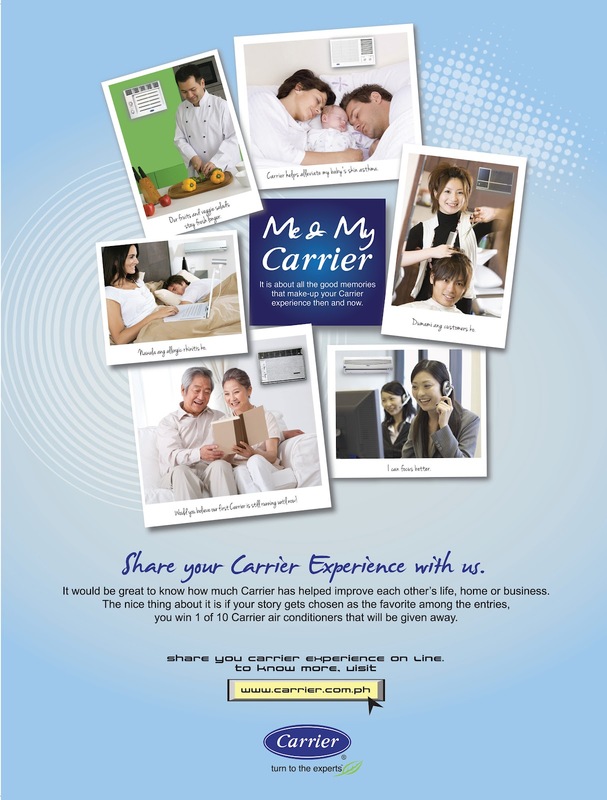 As for the second contest, which is the Carrier Experience, storytellers can share their most memorable Carrier experience to everybody and might give them a chance to the winner of the three 1.0 HP Carrier Designer Series air-con. All you have to do is visit the Carrier Philippines website and fill up the entry submission form. Together with you personal, contact details and a colored photo of your Carrier air conditioning unit, send you short anecdote, which is not more than 500 words, detailing your fondest and most unforgettable Carrier experience. Your anecdote can be done in Filipino, in English or in a combination of both. Once entry is submitted, you will also receive a printable notice from the website acknowledging your entry. A panel of judges will evaluate the submitted entries. Only entries that are submitted on or before April 30 will be qualified and from there, the panel of judges will select the five finalists on April 30 at 6 p.m. The winner of this Carrier Experience will be announced based on the criteria, 80% from the panel of judges and the remaining 20% will come from the online voting in the Carrier Philippines website. The online voting period is from 12 noon of May 1 to 12 noon of May 31. In addition to the top three winners who will receive the brand new Carrier Designer Series1.0 HP window room air conditioner, the entries that will be placed fourth and fifth will each receive a Php1,000 Sodexho gift certificate as a consolation prize. And to know more about this contest and other rules and regulation, of course, you can visit their website www.carrier.com.ph. So, good luck to all the participants! May the oldest air conditioner be found and may the most touching story win!